Carolina Beach State Park Post Cards. Set of 12 cards. Marina sunset (3 cards), Inland waterway (3 cards), Venus flytrap (3 cards), Venus flytrap and pitcher plant (3 cards). 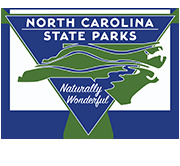 This set of 12 cards features Hanging Rock State Park. Cards are 7" x 5", blank inside and include envelopes.